Principals and School-Leaders: The quality of your leadership makes a big difference in the success of a 1-1 student computer implementation, and these implementations, when well done, make a big difference to your students’ learning success, measured both by narrow academic achievement and a broader array of measures. For the 4 Key Steps for Effective School Leadership in 1-1 computer programs, scroll down to the bottom section with the large heading: The Importance of School Leadership. Regular readers know that I am an enthusiast for connecting our students to and empowering them with the wider world of information and networked collaboration and creativity that is available today, and essential to tomorrow, and I have to say I would be in favor of this even if there were not compelling evidence of improved learning (when defined narrowly by test scores). But if there is quality evidence for improved learning, I’ll take it and use it to advance the cause. The Financial Analysis: a great deal of attention in the book report is upon the financial savings of a 1:1 implementation, short term and long (long-long) term. This is, frankly, of less interest to me, but for schools and districts undertaking a financial analysis of such an initiative, this report will prove helpful, especially for advocates confronting budget hawks who are insisting that 1-1 isn’t financially feasible or possible. Substantial evidence shows that technology has a positive financial impact, but for best results, schools need to invest in the re- engineering of schools, not just technology itself. Properly implemented educational technology can be revenue-positive at all levels—federal, state, and local. Project RED respondents report that technology contributes to cost reductions and productivity improvements—the richer the technology implementation, the more positive the impact. The authors find savings come from a wide array of sources, some of them relatively harder expense analyses, such as reduced copying and paperwork (and the reduced person-hours associated with them, which quickly becomes a much softer analysis), online assessment savings, digital text savings over textbooks, (the certainty of which remains murky), electrical power savings, space savings. Other savings come from much “softer” aspects of what can be saved, financially: reduced disciplinary proceedings, reduced end-of course failures, reduced drop-outs. These are all good things, but the financial analysis of the cost reduction feels sometimes exaggerated. Now I think that it is absurd for us to prepare students for the 21st century workforce and for the world of networked learning without ensuring they have digital, internet access tools in their hands, no matter the cost, but recognize that the financial analysis here is helpful but ultimately limited. Lacking a national consensus, we chose 11 education success measures that provide a balanced view. Many appear frequently in the research literature, and a few are new to this study (primarily those related to financial impact, which is rare in the literature). These 11 ESMs were selected in order to elicit the most valuable information for our hypotheses with the fewest number of variables. The measures were divided into two groups, those that affect students in all grades and those that affect students in high schools. Disciplinary action rate. The frequency of disciplinary actions is a strong, leading indicator of academic success or failure. 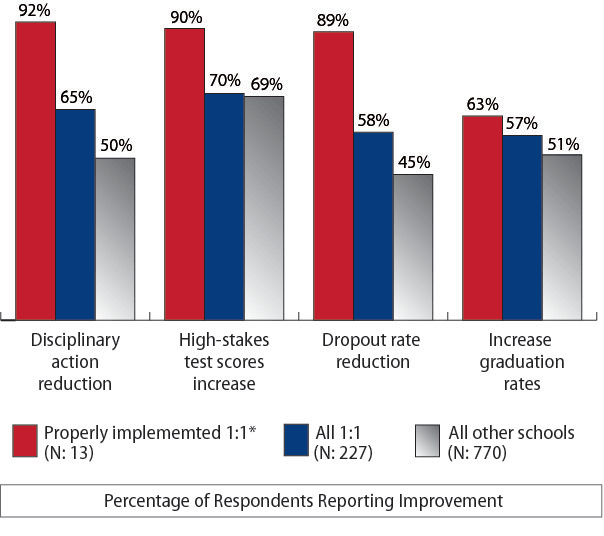 Fewer disciplinary actions mean that students are more likely to be engaged in learning. Also, every disciplinary action costs time and money. Dropout rate. Dropouts are an extreme indicator of the lack of academic success and lead to high personal and societal costs. High-stakes test scores. Any school improvement program needs to have a focus in this area. Paper and copying expenses. This factor is a proxy for other similar school expense centers. Paper and copying machine expenses are more significant than often realized, particularly when labor is included. Paperwork reduction. This factor is a proxy for efficiency savings attributable to technology. When paperwork is reduced, teachers have more time to spend on educationally productive tasks, and schools save other costs (such as storage and records retention). Teacher attendance. Substitute teachers cost the district money and may impact student performance. AP course enrollment. This factor indicates the quality of curriculum and instruction and reduces the time required to graduate from college, saving money for the state and for families. College attendance plans. This factor indicates the quality of curriculum and instruction and facilitates students’ educational planning. Course completion rates. This factor indicates student engagement, achievement, and school quality. Conversely, course failure has severe negative academic and financial implications. Dual/joint enrollment in college. This factor indicates a high level of student achievement and savings in future college expenses. The state saves money in subsidies for higher education and starts receiving tax revenues earlier. Graduation rates. This factor indicates school quality and effective curriculum, instruction, and student planning. Multiple indicators, such as graduation and course completion rates, allow for better triangulation on a self-reported survey. This strikes me as a reasonably good set of measures, and surely we are all happy to see high stakes test scores as only one measure of eleven. Schools and districts setting out on their own 1-1 journeys would do well to review this list as a guide to what they might track so that they can better evaluate their progress over time. I would also suggest schools look hard at adding data analyses such as the High School Survey of Student Engagement or the Tripod Project. The HSSSE, for instance, allows schools to monitor student reporting of how challenged they feel, how creative they are able to be, how often and how much they are writing their own composition, how often they research, how often they collaborate online, how frequently they create projects using technology, and much more that obviously would be of great value in evaluating progress in a 1-1 implementation. A few comments: clearly 2 and 9 stand together, and when combined, underscore the significance of quality leadership for this program. I am a bit stunned to read that teacher collaboration and professional learning is framed as “at least monthly,” because in my leadership strategy I chose to support 1-1 success by increasing teacher collaboration and professional learning to twice weekly, but nonetheless, the directional arrow is the same: more. Online collaboration is so valuable if we seek, as I do, launching students into life-long practice of online networking, collaboration, and learning, so it is great to see it highlighted here so greatly. One of they key curricular take-aways from this report, and a very specific action item every school can undertake, is to identify and implement online collaboration projects and programs for their students. Indeed, online collaboration is a signature element of some of the best known technology integrating high schools in the country, such as High Tech High and New Tech Network Schools. The chart offers compelling evidence for positive impact for narrowly defined academic achievement when well implemented, and more than that, for the increased engagement in school which results regardless of the quality of the implementation. However, the “N” is small for properly implemented 1-1, and hence the deeper significance of the improved high stakes testing is a somewhat qualified. What we can say is that there is support for doing 1-1 well, according to a highly thought out plan, and that at the end of the day, even if high stakes test results will not rise dramatically, they will at minimum hold fast / stay level while other aspects of school success will improve. The Importance of School Leadership: 4 Key Elements of Effective Principal-ship in successful 1-1 programs. The authors of the Project-Red rightly emphasize quality leadership, and, going beyond the website materials to the book, let’s see the case and identify the key pieces. Transformed school leadership is needed for school reform. Technology initiatives present new expectations and a shift from traditional to dynamic, self-discovered tools and resources. To effectively use these tools, school leaders need professional growth experiences that help them become nimble thinkers, skilled problem solvers, and confident facilitators of learner-centered models. 1. Practice Public leadership for the program: setting high expectations, demonstrating commitment, and providing modeling for teachers. The expectations of a school’s principal drive student performance. The relationship between students’ use of technology tools and school leaders’ expectations is consistent with the research that demonstrates the important role of leadership in improving student outcomes. Commitment and high expectations from principals are mirrored by teachers, which leads to increased student success. 2. Make a sincere commitment to consistent access to technology for students. Student motivation and engagement increase when students have consistent access to digital learning tools, and school-level leaders establish those access expectations for students. Leading a technology-transformed school calls for different skills from those needed in a traditional Industrial-age school. To set expectations and provide support, leaders must develop insights and skills related to first- and second order change so that robustly infused technology can create a teaching and learning environment that is dynamic, systematic, and natural. Education leadership programs need to support lifelong learning for administrators to make sure they can keep pace with the skills required for this century. National- and state-level policies should require that school leaders pursue ongoing leadership development and demonstrate their skills through supervised practicums. One note: Web 2.0 tools and vehicles are providing far greater and wider opportunities for educational leaders to keep learning. Joining twitter, entering the blogosphere both as a consumer and a contributor, participating in a MOOC like the Leadership 2.0 program: all these and many more are great ways for school-leaders to learn and grow, as this element requires. 4. Emphasize highly teacher learning and collaboration, with an emphasis on providing time and internal structures for ongoing, internal, faculty learning. Teachers must continually hone their ability to create and improve the 21st-century computer-enhanced learning environment. 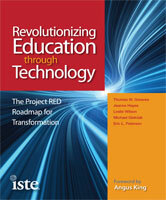 Professional learning is essential for teacher growth in terms of effectively integrating education technology. It is well established that educators need consistent, ongoing professional development in pedagogy, best practices, research, content, curriculum, and the personalization of instruction. We also know that educators learn best through the on-the-job application of best practices, reflection with peers, and collaboration on how to implement theories in the classroom. Effective school leaders provide ongoing, embedded professional development in order to ensure best practices for new century education. Federal, state, and local policies should support the expectation that principals will actively seek, develop, and implement robust professional learning for themselves and their teachers. I should add, and I’ll quote again from the report’s key implementation factors for success, “Leaders provide time for teacher professional learning and collaboration at least monthly.” It isn’t just about having more PD, it is about building in more time into the schedule on an ongoing, permanent basis. “At least monthly” is a bare minimum, I’ll reiterate. My thanks and compliments go to the fine work done by Thomas W. Greaves, Jeanne Hayes, Leslie Wilson, Michael Gielniak, Eric L. Peterson and others at Project Red.